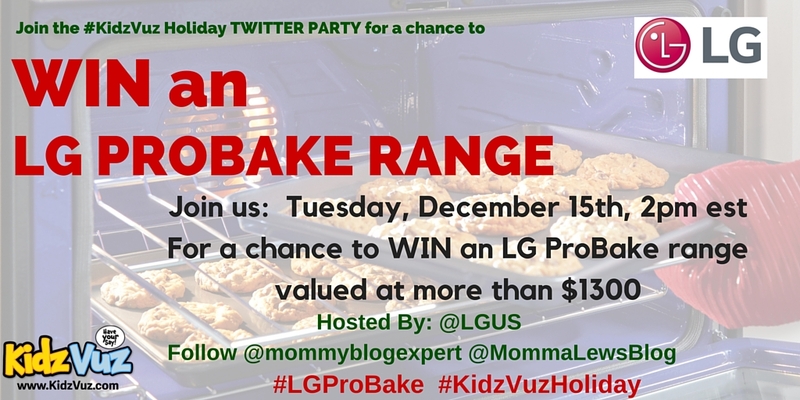 KidzVuz Holiday Twitter Party at 2 pm ET with @lgus @mommyblogexpert @mommalewsblog. Prizes: LG ProBake Range ARV $1300+. 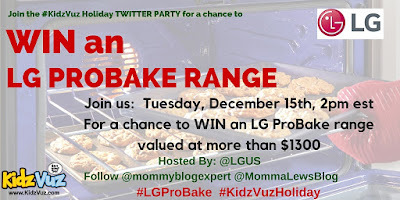 #LGProBake #KidzVuzHoliday. You always have so many amazing Twitter parties listed! I wish I could be a panelist more often, because the social times you have at Twitter parties is just fantastic also wining prizes and learning more about the brand is a bonus! I always enjoy a good twitter party! I'm looking forward to participating in the Claus&Paws party tomorrow! Thanks for the great twitter party list. You really are amazing at gathering up all that info into one place. I see at least one on the list that I'm going to for sure try to make. They're giving away games! This week is going to be a very busy Twitter party week. It sounds like lots of fun though! Several of these are on my list! Love that there are so many right now - lots of chances to win! Thank you so much for this twitter party calendar! I love being able to schedule ahead of time and knowing what to do next. I don't have much time to attend or host a twitter party, but i didn't realize how popular they were. I may have to start attending twitter parties. Thanks for doing these Twitter party roundups, I'm going to share the list with my friends. We love it when we find a party we can attend virtually together! Lots of great Twitter parties. I have guests coming, so I am not sure how many I will have time for. Great list to check out sometime this week. Twitter parties can be fun! This is such a valuable resource to bloggers and sweepstakes fan. Thank you for taking the time to add these for us! Thanks for the update on this week's parties. I'll have to mark my calendar for a few of these. I really love this twitter party curating you've been doing. Thanks so much! I absolutely love what you're doing. I love twitter parties, and it's nice to be able to find so many in one place. I've scheduled a few of these in! There are some really nice prizes coming up. Thanks for the great Twitter calendar. I will have to try to get to as many as i can. I love twitter parties!! This is a great list of them, I need to remember to attend them. What a great list and tons of awesome prizes. Definitely adding some of these to my calendar! I love that you post a list of your Twitter parties. Thanks for sharing. 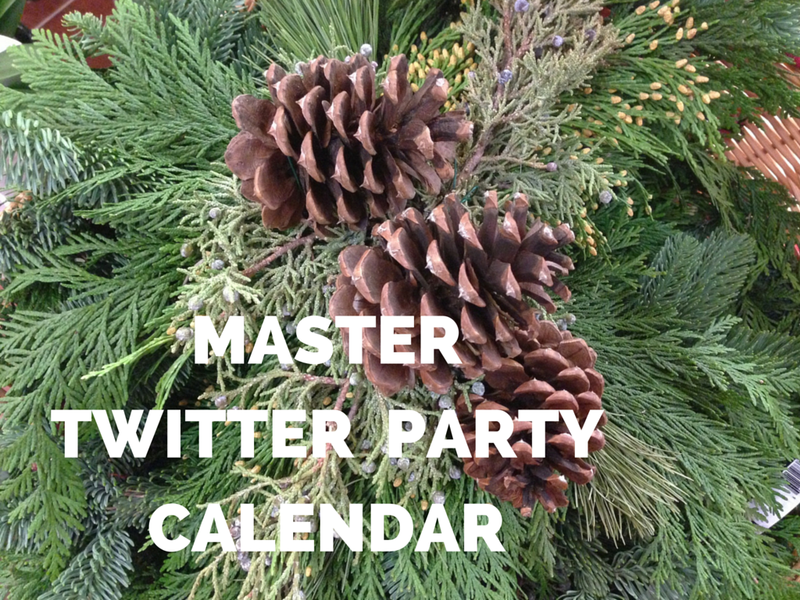 My twitter party calendar is now full! Thanks for keeping us informed! i just started participating in twitter parties adn i love them. they are so fast pace and exciting. thanks for sharing this party list. Thanks for compiling this list! It can be so hard to keep track of twitter parties! You have the best list of Twitter parties. Looks like I'll have a busy Thursday with all those parties on Thursday. What a great resource this is! It is really a gift to have in the rush of the holiday season. Thank you so much! I am totally digging this Twitter party calendar you've been bringing us. Thank you so much! I am hoping I have time to attend more Twitter parties after the New Year. Thanks for the compilation! I love twitter parties they are fun to host and to take part in. I need to remember to attend some of these. looks like I missed a few really good ones but I can catch the tail end of this week and next week before cutting off internet for the holidays! great parties and so many wonderful prizes! So many great parties. I will have to pay more attention to these parties! I would love to win some of the prizes.